Google search has many useful tools and features, you can get the weather, time, perform basic calculations, convert denomination like dollar to rupees right on the Google search page. Google has a useful set of tools for web developers and bloggers such as Google web developer tools, Google Analytics and Adwords etc. and now Google has integrated one more useful tool for web developer in Google search. 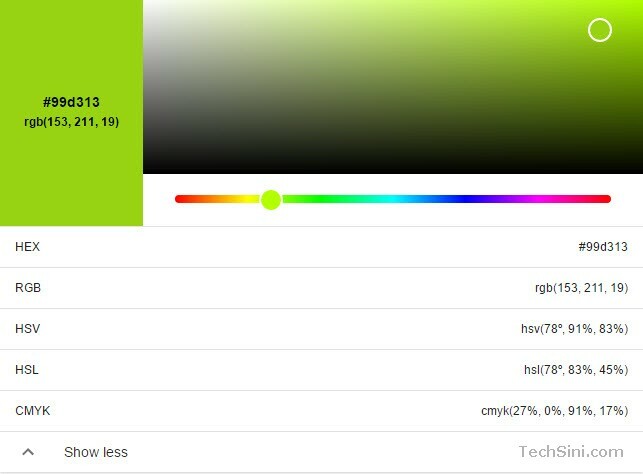 Google has integrated a useful RGB to HEX converter tool in Google search page to easily convert RGB to HEX color code, not only to HEX but you can also get RGB’s converted values in HSV, HSL and CMYK. How to Convert RGB to HEX in Google Search? To convert RGB to HEX color code – go to Google.com and search for “RGB to HEX”, you will get RGB to HEX converter right on the Google Search page. Move the color picker to select the color you wish and you will get converted values instantly in the color table below. Google developers could have added an input box in RGB to HEX converter tool to enter the RGB value manually, now you have to select the required color using color picker which is quite time-consuming task. Hi, I found small but nice blog. I have tried to convert color code in Google.com and in Ashbox.com. I must say your provided links are also useful. Thanks for sharing. Thank you for your words Gaith.